Talk of the Town, the size of our Birthday Cake! Wow! Beautifully decorated and tasty! Our Charity outdid themselves! Thank you. Surprise! Surprise! There was a mixture of flavours to choose from: Vanilla or Red Velvet! The icing was not sweet at all (believe it, I am not a sweet tooth), thereby making it edible! Every bite a party in your mouth! Thanks to those that filled the Honesty Jar for costs of baking the cake. All monies went to our Charity, Locals Helping Locals, who lovingly baked this masterpiece! Cannot wait for the next celebration ... more cake!! A birthday is not a birthday without a birthday cake. 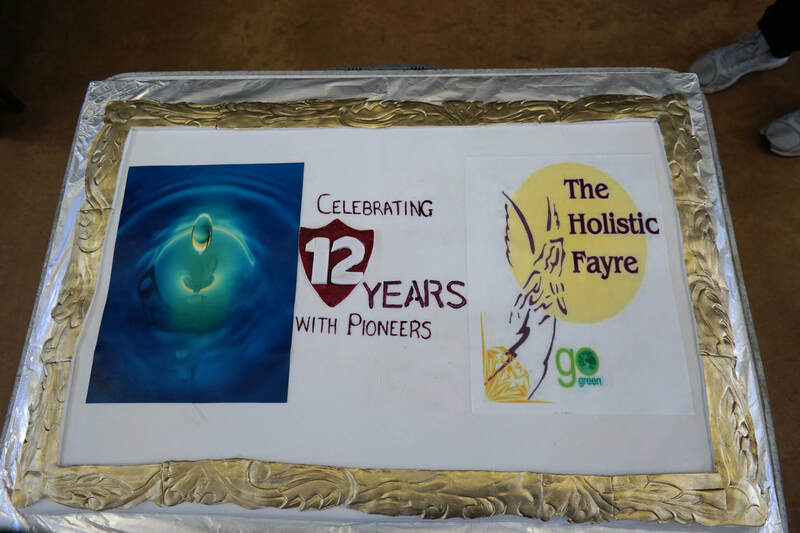 Every year, The Holistic Fayre, Bothasig, has celebrated its birthday with a birthday cake. As you might know, we have an opening ceremony before every market. It is during this time, that the birthday cake is sliced and shared, leaving mere crumbs on the cake plate. This year, on our 12th birthday, Johanna Kotze from our charity, Locals Helping Locals, offered to bake us a huge cake for our birthday celebrations. Deborah Voskule, is the official baker for Locals Helping Locals, and often bakes cakes for raffles. Thanks to Johanna and Deborah for their efforts and care, you too will now enjoy a slice of cake. To cover expenses for the baker, we have an honesty jar. It’s because you are as important and beloved as the gods. Kind of. The ancient Egyptians are credited with “inventing” the celebration of birthdays. They believed when pharaohs were crowned, they became gods, so their coronation day was a pretty big deal. That was their “birth” as a god. Ancient Greeks borrowed the tradition, but rightfully realized that a dessert would make the celebration all the more meaningful. So they baked moon-shaped cakes to offer up to Artemis, goddess of the moon, as tribute. They decorated them with lit candles to make the cakes shine like the moon. Hence, the reason we light our birthday cakes on fire.